One of the best fitness tools you can use is jump rope. Jump rope can be considered as the ultimate total body fitness tool as it focuses on a variety of different areas – including the brain. Your legs propel you upwards, while you keep most of the rest of the body tensed (similar to a plank) all the while your brain is focused on the timing and coordination to keep the rope turning. Your vertical jumps combined with your muscle contractions also gets your lymphatic system working; and besides jumping on the trampoline, skipping is the best thing to assist your lymphatic system and keeping it working effectively. Also, the spring like action of your jump means your knees and other joints do not absorb the same level of direct impact force that occurs when you run (heel strikers) so it has less of an impact on your body. Of course you want to burn calories, and jumping rope really gets the heart pumping! This makes it an effective way to lose the calories and maintain your figure. 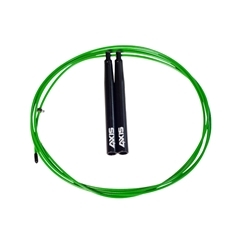 Since jump rope is a very portable piece of fitness equipment, you can take it with you practically anywhere. If you live in a small apartment or have lack of space, a jump rope can easily be tucked away but still gives you a kickin' workout - no excuses! Now which rope should you get? If you are just getting started you may want to get a rope with a bit of weight to it. Beaded jump ropes are ideal for beginning as they keep their shape as you turn them and you hear the loud ‘clack’ when the rope hits the ground – giving you the audible cueing for timing the next jump. But many people will be able to jump right past this step as many are familiar with jump ropes from elementary school or their childhood in general. 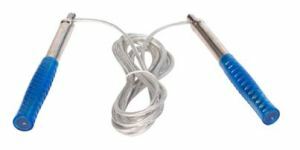 I often recommend the Fitnesstown Steel Cable Jump Rope as it has a bit more weight than the ultra light coated cable or wire ropes, but it still responds more quickly for getting started with double-unders. For those who are a bit more advanced but intimidated by a cable rope, try the Buddy Lee skipping rope. This brand is known for being lightweight with super smooth bearings that is moderate in weight. An awesome feature of the Buddy Lee ropes are that you can buy replacement ropes and swivels as you wear through them with all that skipping you will now be doing! Another customer favourite for when looking for a more something more advanced are the cable ropes. 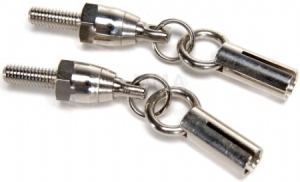 Cable ropes come in coated or uncoated wire options. The uncoated wire is for those with a true dedication to getting the best time regardless of consequence – as these wire ropes will leave a mark! But an advantage of the uncoated rope is a super fast rope that unspools perfectly as it’s less likely to get tangled and doesn't kink easily. The coated ropes have two categories – the coating with memory and coating without memory. These are easy to tell apart – as the one that without memory will just straighten out perfectly right out of the package - similar to the uncoated wire. Good coated ropes and brands without memory to consider are the Axis Vinyl Green rope and Momentum. My personal favourite coated ropes with memory are the Axis Super Speed Blue rope, the Revolution Super Speed rope and a majority of cable ropes available at Fitness Town. These will require a bit of time to loosen up and straighten out, however it also depends how they are packaged. This might seem to be of no importance, but shorter 4” handles means your hand will sit close to the rotation. I prefer longer 6” handles as it requires smaller movements of my wrists that are transferred through the lever. In other words, the longer handle makes for bigger movements with less effort. The Buddy Lee Master Rope has an even longer 9” handle which some people love and can also be used for rope tricks. The handles can also be made from a variety of materials including wood and reinforced nylon. Typically the lighter the rope, the better for speed and the heavier the rope, the better it is for working your wrists. So try them all out and see which works best for you. These are what transfer your wrist rotations into the rope rotation and the smoother this transfer the less effort is required to keep the rope turning especially for fast movements like double-unders. Now, the standard speed jump rope many of us have used in elementary school consisted of a cheap plastic handle with vinyl or PVC rope. These have no bearings as the rope simply rotates inside the plastic – causing friction and wearing of the rope overtime. These are inexpensive and great for trying out skipping (hence why we sell a majority to schools and bootcamps) but these do not make skipping as enjoyable compared to a more upscale rope. There are many different types of bearing ropes on the market – best thing to do is to test each out. The Buddy Lee, Momentum and Axis ropes have some of the best bearings on the market. Hopefully that gives you a several options to consider when selecting the perfect jump rope! If you're still unsure of the differences, come into Fitness Town where our Fitness Experts can help find your perfect match or visit us online at www.fitnesstown.ca. I have had an Axis skipping rope only used 2 months snap on me shall I bring it in to the store or contact the company please let me know. Hi Simon, thanks for letting us know about your Axis skipping rope. At Fitness Town we strive to provide the highest quality equipment and exceed our customer's expectations. We recommend that you contact the Fitness Town store you purchased the skipping rope at. To help us assist you faster, please have your invoice ready as our sales associate may require this information. If you have any additional questions, please feel free to reach out to us at marketing@fitnesstown.ca.